This size chart will help determine the correct size to order for your style and color preference. UFM Underwear offers sleek, streamlined tailoring. Our sizing is measured by your waist measurement, just like sizing for men’s pants. This means you get a waistband that fits and doesn’t ride up or down. Underwear For Men are made to move with you! How To Measure Your Waist: Measure around your natural waistline—right above your hips. Be careful not to squeeze too tight to allow a little give. All of our size measurements are in inches. Which Generation Is Right For You? The 1st Gen product line has an adjustable pouch that ties on the inside. It comes in black and sizes up to a 42” waist. The 2nd Gen product line has added compression in the fly for more support and the pouch ties on the outside of the waistband for added comfort. The 2nd Gen product line is available in black, red and gray, and sizes up to a 54” waist. 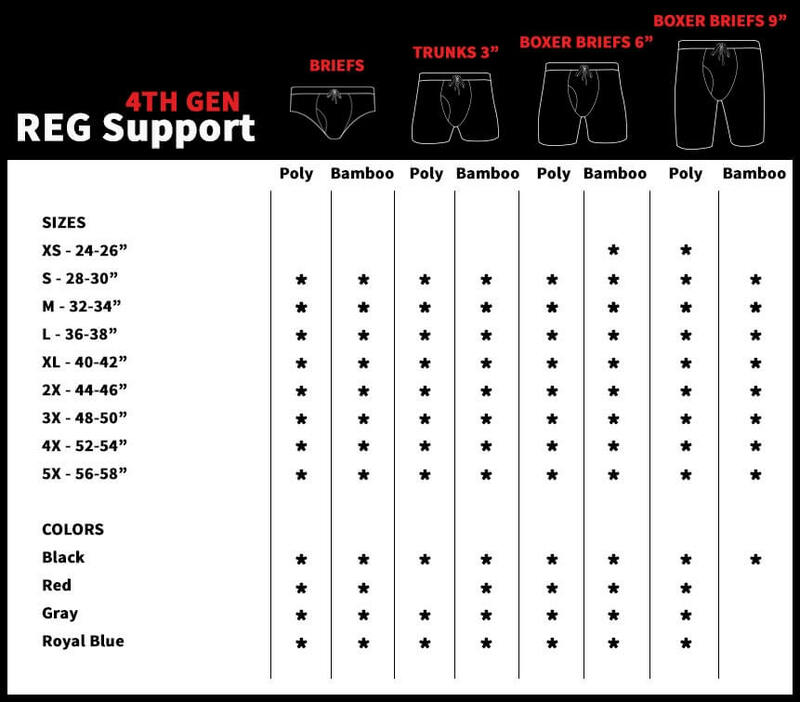 The 3rd Gen product line (MAX Support), is just like the 2nd generation, but the sizes were adjusted to range from S (28-30”) to 5XL (56-58” waist). The 3rd generation is available in black, red, gray, camo, royal blue, turquoise, and white. We also designed a boxer brief with a 9” inseam that also includes our US patented and Intl patents pending adjustable pouch. The 4th Gen (REG Support) product line has shorter drawstrings and a second material option. We still offer our polyester blend but we also added a 95% bamboo/5% spandex brief and boxer brief option. We also designed a turn with a 3" inseam that also includes our US patented and Intl patents pending adjustable pouch. Our Polyester Spandex blend is available in Black, Red, and Royal Blue. Our Viscose Spandex blend is available in Black, Red, Gray, and Royal Blue. Sizes now include XS (24-26’’) to 3X (48-50’’) waist. Currently you can purchase the 9’’ Poly and 6’’ Viscose Boxer Briefs in the XS (24-26’’) waist. No matter what you are doing or where you are going, moisture wicking material for your mens underwear is always a good idea. Our brand is made with moisture wicking materials to keep you cool and free of sweat. Underwear For Men briefs and boxer briefs are commonly worn for working out, swimming, enjoying time with friends and family, going to work, recovering from medical conditions, going to the office, doing yardwork, and more. Thanks to the moisture wicking material, you won’t need to change pairs of underwear for different parts of the day. For more on the science behind UFM’s moisture wicking technology, check out our blog. Are you tired of the standard sizing for men’s underwear? When you purchase UFMs, you always know you are getting the right size for your body because of the waist measurement. We now sell Big & Tall sizes for guys with larger waist measurements. Our brand is able to accommodate up to a size 5X, or a 58’’ waist. In addition, we offer a longer inseam length of 9 inches for guys that prefer longer boxer briefs. This is advantageous for men with larger or more muscular legs. The tapered leg design of our mens underwear stays in place on even the most muscular guys. We know this is a hassle for athletic men and eliminated the issue by creating a boxer brief that moves with your body. No matter which size, generation or color you choose for your Underwear For Men purchase, you are sure to reap all of the benefits of our comfortable, high-tech boxer briefs and briefs. Our company has considered a complete range of design features to provide you with a versatile product to suit your needs. Our pouch underwear started as an athletic underwear. It didn’t take long for us to realize that men loved wearing UFMs for everyday, work, sport, and medical uses. Underwear For Men has amassed a range of five-star reviews from men that rave about the features of our products.